I'm in the middle of making Valentines pouches for my kids. In between doctors visits, school out, and such, it's been a slow process. I'm glad I hadn't gotten too far, because there have been so many cute things out in the crafty ranks. Let me walk you through a little history first. I bought the Love Pouch pattern from Melissa last year, and found fabric on sale after Valentines, so this has been a long time coming. Kalleen posted her darling pouches, and I knew I had to do a meld of the two patterns. Next, Kalleen posted more inspiration, and I fell in love with this idea on Our Scoop. Completely enamored by the inset heart, I wanted to do something similar, but with fabric and not felt. Finally, Vanessa has this darling pillow...and I was hooked. The only thing is, I didn't want the rough edge on my hearts. So, after such a long introduction, here's my solution. Plus, a heart template of your choosing. I drew mine on some cardstock. Step one. Trace the heart on to the interfacing, adhesive side up. This won't work unless you have the iron-on dots going to the back. Step Two. Identify where you want to place the heart, and pin in place. Mine is two inches from the bottom and centered. You are sewing the interfacing to the right side of your fabric, with flat side of the interfacing against the fabric (dots facing out). Step three. Sew around the tracing line. Be sure you are using a locking stitch at the beginning and end of your stitching. I recommend using a shorter stitch length, just to keep this really tight. On my machine, I used a 2, rather than the 3 I usually use for topstitching. Step four. Using your sharp scissors, cut into the middle of the heart. Then trim all the edges. Clipping curves allows for easy manipulation of the interfacing when you pull it to the back. You'll also need to clip the outer interfacing at the dent at the top of the heart, and point at the bottom of the heart. Step five. Tuck the interfacing to the back side of the fabric, and iron in place. When you get to the indent at the top of the heart, and point at the bottom, work one side at a time. Step six. Add contrasting fabric. First, iron in place. You can use a few pins, to hold things together if you choose. Just be sure to remove them before you sew over them. UPDATE: I finished up the Valentine's Pouches. You can see them HERE. 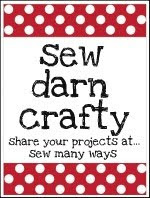 Featured on Craft Gossip, Be Different Act Normal, Whimsy Couture, and Sew What's New! Sharing with Creation Corner, Freckled Laundry, Kojo Designs, Tatertots and Jello, Be Different Act Normal, Along for the Ride, and The Girl Creative. You make it look so easy. I really want to try this technique. I'm so glad you are making pouches, they are the greatest thing ever. Time consuming, but I think it will be worth it if we use these year after year. @Kalleen at Second StreetThanks, Kalleen! It really isn't too hard. Just takes some practice. I'm already thinking of other ways I could use this technique! This is awesome, Chris. I've been working on an idea, and this may be just what I need to get it to work out. Great tutorial! Wow, I'm impressed at how good that looks. I will have to keep this in mind for future use! Awesome!!! This looks so pro! love it! super easy and handy, thanks Chris! Oh, how I wish I could sew. Maybe I can get my mom to do this for me. Thoughts of what could be if I could only sew! Great tutorial! What a slick idea! And it turns out so perfect! Thanks! First of all thanks for posting this super little round up of these mail pouches! and second, that tutorial is super, I have used the dryer sheet method to make a finished heart applique, but I have never tried this finished inset method. Very professional! Fabulous!!! I also hate the raggy raw edges & think this is genius - thanks! Gorgeous! Your kids are going to love them! I hope you're doing well. So cute, you might just inspire me to dust the cob webs off my sewing machine! sewing 101.... what a great idea! I just stubbled across your site this morning and glad i did. Great site! Great tutorial, Chris! Always wondered how to do that! I think I might have to give this a try for my Quilts for Queensland squares. Looks so cute! Genius! I saw those other cute tutorials but wanted the edges of the heart to be finished. Thanks for sharing! This is a great idea! I would not have thought to use the iron-on interfacing to make the nice, neat hole first. I think a lot of projects will start showing up using your method. Thanks for sharing this tutorial. I have to get my valentines day ideas done and this with work wonderfully. Wow! You are a genius. Thank you so much for letting me know you tried the SMS tutorial. It allowed me to drop by your wonderful blog. In just my short visit, I've already seen several things I want to try, this being on the top of my list. I better get to it, Valentine's is just around the corner. I'm a newbie and thanks to your tutorial Im pretty sure I can do this and bonus I dont have to buy any thing special to do it (I already have interfacing and fabric to practice).